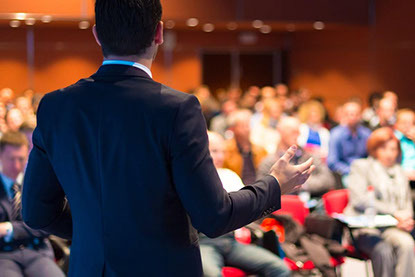 A keynote speaker could be the difference between a hit event and a bust. Joe Yazbeck offers some ways to ensure a hit. 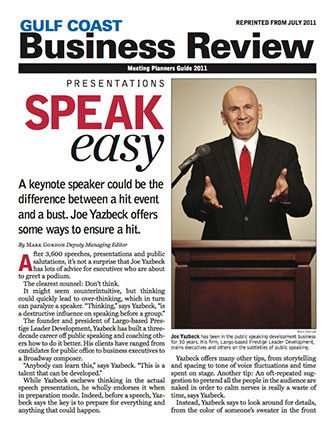 After 3,600 speeches, presentations and public salutations, it’s not a surprise that Joe Yazbeck has lots of advice for executives who are about to greet a podium. The clearest counsel: Don’t think. The founder and president of Largo-based Prestige Leader Development, Yazbeck has built a threedecade career off public speaking and coaching others how to do it better. His clients have ranged from candidates for public office to business executives to a Broadway composer. Click to read the full article (PDF file). I have made Tampa Bay my home now since 1996. 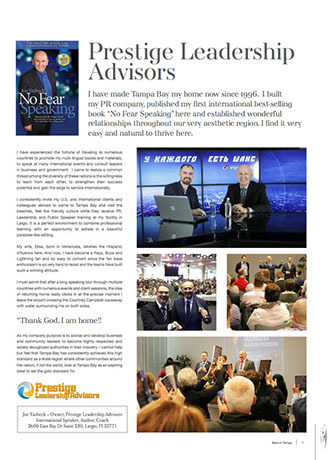 I built my PR company, published my first international best-selling book “No Fear Speaking” here and established wonderful relationships throughout our very aesthetic region. I find it very easy and natural to thrive here. 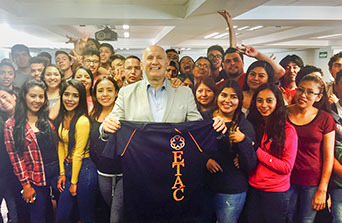 I have experienced the fortune of traveling to numerous countries to promote my multi-lingual books and materials, to speak at many international events and consult leaders in business and government. I came to realize a common thread among the diversity of these nations is the willingness to learn from each other, to strengthen their success potential and gain the edge to service internationally. I consistently invite my U.S. and international clients and colleagues abroad to come to Tampa Bay and visit the beaches, feel the friendly culture while they receive PR, Leadership and Public Speaker training at my facility in Largo. It is a perfect environment to combine professional learning with an opportunity to exhale in a beautiful paradise-like setting. As an entrepreneur with a plan for improving your business acumen in the New Year, you may decide to step it up a notch and set performance goals that involve public speaking or leadership projects. Joe Yazbeck, president and founder of the Largo-based Prestige Leadership Advisors, has the wisdom and willingness to help you succeed. He offers a template on how to organize and build a speech that is unscripted and fully expressed. Yazbeck describes himself as an artist with a lifelong quest for improvement. A jazz vocalist, actor, public speaker and leadership coach, he is no stranger to performance anxieties and understands many factors contribute to the degree of one’s comfort level in front of a group. 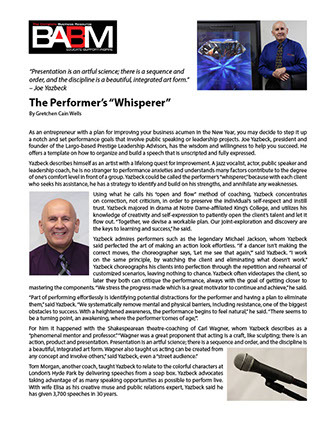 Yazbeck could be called the performer’s “whisperer,” because with each client who seeks his assistance, he has a strategy to identify and build on his strengths, and annihilate any weaknesses.